Keep your SilverBack™ vapor barrier clean from hand prints that will need to be washed off later. These gloves are made of soft nylon for a comfortable fit. 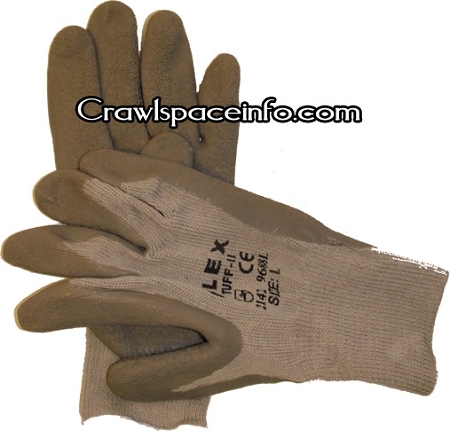 The palm of the glove is dipped in rubber to give the glove protection from mud, dirt and crawl space grossness. The rubber coating allows for a quick rinse and the glove is clean again, unlike cotton or leather gloves where the dirt can penetrate the pours of the material and smear mud or dirt onto the vapor barrier. One size fits all- Adult sizes only. Colors will vary.